Since I thought that in our last program we sort of rushed through Chapter 8, which I was not at all prepared for at the time, I will begin from there. First let me offer a summary from the previous chapters. In Chapter 6 we saw what we have interpreted as a description of the fall of Rome, which was ultimately at the hands of the Germanic tribes. This culminates in Chapter 8, and it all corresponds with Daniel Chapter 2, for instance especially with 2:45 where it states that “Forasmuch as thou sawest that the stone was cut out of the mountain without hands, and that it brake in pieces the iron, the brass, the clay, the silver, and the gold; the great God hath made known to the king what shall come to pass hereafter: and the dream is certain, and the interpretation thereof sure.” Once the interpretation of the Revelation of Yahshua Christ is made certain, we see that the hand of Yahweh in the world is indeed upon the Aryan peoples, and by that, we know the identity of the true Children of Yahweh. The people who we know today as jews have always been His enemies, and have never been His people. And, of course, the many proofs of that lie elsewhere. So in Chapter 6 we saw the Fourth Horse – the pale or green horse - of the Apocalypse, which was the sickness in decay and corruption of old Rome. Then with the fifth seal we saw the saints under the altar cry out for justice. With the sixth seal we saw the great men of the empire wishing that they had a safe haven in which to hide from the judgement and wrath of Yahweh which has befallen them. The “stars of heaven” of 6:13 must be the Germanic Invaders, as the children of Israel are also called in the Old Testament, for example in Judges Chapter 5 in the song of Deborah where she states of Israel that “They fought from heaven; the stars in their courses fought against Sisera”, the leader of Canaanites. In Revelation Chapter 7 we saw in verse 1 what appears to be a momentary suspension of the destruction of the empire, and the sealing of the 144,000 – twelve thousand from each tribe, and then the innumerable multitude. These things are, I believe, representative first of the righteous remnant of Yahweh which would survive the tribulation that was to come upon the Roman empire, and second it is a description of the multitude of those who would be punished in this tribulation, all of them Israelites, who would wash their robes and whiten them in the blood of the Lamb, and these people in white robes must be the same people with white robes which we saw in Chapter 6 with the fifth seal. Now we shall proceed with Chapter 8 and the fall of Rome. Because the Christogenea New Testament and the King James Version have very few actual differences in translation in Chapters 8 and 9, except for names and titles, I will read from the Christogenea New Testament. The Roman Empire had been threatened by the Germanic tribes for quite some time, and even Julius Caesar in his own description of the Gallic Wars complained that the Germanic tribes were forever pushing west of the Rhine. Throughout the centuries of the Empire there were emperors who attempted to buy off the invading Germanic tribes. The examples are numerous. Augustus offered many tribes land, or bribed their chieftains, in order to gain them as allies. In the third century Caracalla fought against and then bought off the Alamanni with a large sum. 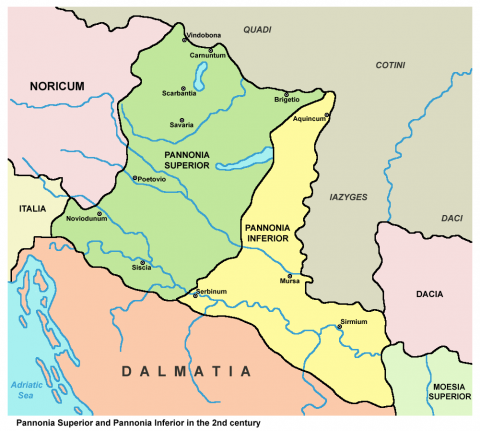 In the fourth century Constantine bribed the Vandals with the land of Pannonia, which they inhabited for quite some time before becoming restless once again. Discussing Chapter 6 and the invasions of Rome by the Goths and Vandals, the following was mentioned, and here I will elaborate a little further: With the anarchy of the mid-third century, the city of Rome itself began to lose its lustre, and with Constantine in the early 4th century the capital was moved eastward. In 364 AD the empire was divided east and west, and this represents the beginning of the dissolution of the ten toes: the splitting of the original provinces of the empire as it existed under the first Caesars. The eastern portion would last another thousand years, however the west fell quickly. Later in the fourth century the Visigoths, after defeating the Romans in a large battle, were given leave to cross into the lands of the Empire. Eventually they were mistreated by Rome, and rebelled against the empire. Around 406 AD tribes from out of the Vandals, Alans and Suebi crossed the Rhine into Gaul and began to loot and pillage the empire, and take much of its lands in Gaul and Iberia, which were never recovered. The Visigoths at this same time raided Greece, and then invaded Italy. At first the western empire attempted to buy off the Goths with a large sum of gold. Rome was then sacked by the Goths under Alaric in 410 AD. The years from 433-453 AD saw the Hunnic Empire under Attila and Bleda, who raided the Balkans, Gaul, and Italy, threatening both Constantinople and Rome. The Vandals then sacked Rome in 455 AD. The Huns were bought off in the east with a large grant of land which eventually became Hungary. But looting and bribes were eventually not enough for the Goths, who really wanted the fertile soil of Italy and the treasures of the empire for themselves, and so finally in 476 AD they took it, when the Gothic chieftain Odoacer declared himself ruler of Italy. Rome could no longer defend herself first because the empire was completely corrupt and decadent, but more importantly, as Daniel 2:43 attests, because there was little unity in the citizenry, which was now made up of people of diverse and mixed races. 8 And the second messenger sounded the trumpet, and thus a great mountain burning with fire had been cast into the sea, and a third of the sea became blood 9 and a third of those creatures having souls of those in the sea died, and a third of the ships had been destroyed. The Vandals, along with the Goths were indeed descended from the Israelites of the Assyrian deportations, yet it had been quite a long time in their history since they had ever been sailors or had any sort of maritime tradition. Upon the invasion of Spain, the Vandals had taken the Balearic Islands off of the Spanish coast. From there, along with many of the Alans, they crossed to Africa, and Procopius states that there were no Vandals left in Europe – or at least in those parts of Europe which he was acquainted with - in his time, which was about a hundred years later. In Africa the Vandals eventually made a treaty with Rome, in 435 AD, dividing the coastline. Yet the Vandals still did not cease from their looting and pillaging of the coasts of Africa and Sicily. In October of 439 AD, the Vandals under Gaiseric made a successful surprise attack on Carthage. He had his designs on both the city and the large port. They took the city and found a large Roman fleet laying in the harbor waiting for them. This was a devastating strategic mistake on the part of the Romans, to allow such a large supply of ships to fall into the hands of their enemies. The fall of Carthage to the Vandals greatly disturbed both the western and the eastern empire, as there was a large number of galleys and a great shipyard in Carthage, creating a Vandal fleet as great as the joint navies of both empires. That the Romans allowed for so many ships to be left in Carthage's port while the Vandals were so close by, must be one of the greatest errors of Roman history. The very next Spring, that of 440 AD, a vast fleet manned by Vandals and their allies (Alans, Goths, Romanized Libyans, and even Moors) set out from Carthage for Sicily, which at the time was the principal supplier of oil and grain to Italy after the loss of North Africa. All the coastal towns were looted and Palermo was besieged. Ships heavily laden with plunder returned to Carthage. The powerful eastern imperial fleet responded by sailing into Sicilian waters in 441 AD, taking the Vandals by surprise. This was under the command of the Romano-Goth Areobindus, but a major invasion of the Balkans by the Huns and the threat of a Persian attack, forced him to take his fleet back home. After this Gaiseric allowed his fleets to continue plundering throughout the western Mediterranean Sea. The Vandals then plundered Rome itself in 455 AD. The Western emperor Majorian was the last to try to hold onto the old Roman Empire against the invading barbarians. Gibbon said of Marjorian that he “presents the welcome discovery of a great and heroic character, such as sometimes arise, in a degenerate age, to vindicate the honor of the human species.” Marjorian planned a naval campaign against the Vandals to reconquer northern Africa in 461, but word of the preparations got out to the Vandals, who took the Roman fleet by surprise and destroyed it. A second naval expedition against the Vandals, sent by emperors Leo I and Anthemius, was also defeated, in 468. 10 And the third messenger sounded the trumpet, and a great star fell from heaven, burning as a lamp, and it fell upon a third of the rivers and upon the springs of waters, 11 and the name of the star is called Wormwood, and a third of the waters came to be wormwood and many of the men died from the waters because they had been made bitter. Bertrand Comparet in his own Revelation sermons identified this star with Attila the Hun. That is based on the idea that somehow the Huns were not White, and that is wrong on both counts. The Huns were indeed White, and this is not referencing Attila. When Clifton Emahiser had put together his transcriptions of Comparet's Revelation series along with a lot of my notes, I disputed the identification of this passage with Attila. Now I can do so much more effectively. First, this passage is after the one which describes the invasions of the empire by the Goths and Vandals, and yes, the Huns. Yet the Huns had already come to relative peace with the eastern empire, and were no longer a threat to the west, when the Vandals had their maritime escapades, which we have seen described before this. Secondly, Procopius describes the Huns as tall and very fair. Procopius also equates the Massagetae and the Kimmeroi to the Huns on several occasions, therefore esteeming them to be of Germanic stock. Now the depictions of Attila as a short Asiatic runt come from Jordanes, the Gothic historian, but he wrote in the seventh century – a hundred years after Procopius – and his main source was the Gothic propagandist Cassiodorus, whose work has hardly survived. Cassiodorus, a Roman Senator under Gothic rule, wrote his history in a manner very flattering to the Goths, who were once ruled over by and therefore despised the Huns. The depictions of Attila by Cassiodorus and Jordanes are clearly little but propaganda. However other records of Attila exist, where he is often mentioned in Germanic writings such as the Edda and the Nibelungenlied. In Germanic poetry, Attila is depicted as a much more noble character, and in the Nibelungenlied he even receives the widow Kriemhild – the wife of the slain Burgundian prince Siegfried, as a wife. It can be told from Daniel Chapter 7 that upon dissolution of the toes, from one of them would arise ten horns, and then an eleventh which would subdue three kings. This describes Justinian, the eleventh emperor of the eastern empire, during whose reign the Vandal King Gelimer was defeated in Carthage and the Gothic kings Witiges and Totila were defeated in Italy. During the wars of this period, much of Italy and Sicily were laid bare, the Vandal kingdom of North Africa was wasted and many of the Vandal soldiers were forcibly relocated to the east in the service of the conquering Byzantines. The city of Rome was practically deserted for an extended period of time. This, it can be ascertained, is the wounding of the head in another vision – that of the beast of Revelation Chapter 13. The empire is dead, but the beast and the dragon which gives its power to the beast still live to rise again – as the Roman Catholic Church! When we get to Revelation Chapter 13, the correlations with Daniel 7 will be discussed at great length. This star which fell from heaven made a third of the waters bitter because Justinian would prevail over the Germanic peoples in Italy and Africa, and this in turn would also pave the way for Catholicism in Western Europe. Therefore, it is evidenced that this passage in the Revelation also refers to Justinian, just as the little horn of Daniel Chapter 7 does. 12 And the fourth messenger sounded the trumpet, and a third of the sun had been struck, and a third of the moon and a third of the stars, that a third of them had become darkened, and the day did not shine for a third part of it, and likewise the night. While it is not esteemed that the symbolic language of the Revelation should always be interpreted literally, here we do have a physical proof of the veracity of the interpretations of the Revelation which we have seen thus far. And while the references to the sun, moon and stars are not to the mere objects in heaven, but rather they are symbols of organized government and people, there is still an absolutely striking occurrence which happened in 536-537 AD, which points to a certain and literal fulfillment of this passage. Of the very time when the great general Belisarius had defeated the Vandals and taken Carthage for the Byzantines. Procopius writes thus: “For the sun gave forth its light without brightness, like the moon, during this whole year, and it seemed exceedingly like the sun in eclipse, for the beams it shed were not clear nor such as it is accustomed to shed. And from the time when this happened men were neither free from war nor pestilence nor any other thing leading to death. And it was the time when Justinian was in the tenth year of his reign.” This is found in the Loeb Classical Library edition of Procopius, Book 4 Chapter 14 Section 5. By this we also know that the interpretation of these passages as having to do with the wars which destroyed the old Roman empire, but also brought great harm to the people of God who brought that empire down, is absolutely certain. Yet the dulling of the Sun during this year only represents and reflects the events as they were happening upon the earth, for after the passing of Rome, much of Europe also fell into the so-called Dark Ages. Arabia is renowned as a land of locusts. The locust eggs stay under the desert soil until it rains, and then they begin to hatch and swarm. (See the Earth Observatory website hosted by NASA which has much information concerning this.) This helps us identify who these people are and where they come from. Egypt and Arabia were one of the four portions of Alexander's empire, from where the Ptolemy's ruled until Roman times. The “latter time of their kingdom” is just as well a reference to the Greek rulers in general as it is to the Ptolemy's themselves, and the Greeks are still the rulers of the east in the Byzantine period. The scorpions of the earth are a reference to the Canaanite Jews. This can be seen at Luke 10:18-19 where Yahshua Christ said “I beheld the Adversary falling as lightning from heaven! Behold! I have given to you authority to tread upon serpents and scorpions, and upon all the power of the enemy, and no one shall by any means do you injustice.” The serpents and scorpions were not to be taken literally in that passage, but as metaphors for certain people, which we see are of the Adversary, or Satan. The 5 month period of the locusts seems to represent the approximate 150-year period of Islamic conquest over the Byzantine lands. This period began around 622 AD when Mecca was entered by Mohammed and was eventually conquered, process which ended in 632 AD. Within two years of Mohammed's death, his followers began their conquests outside of Arabia, first taking Syria, Persia and Palestine. In 652 AD they already began attacking Sicily, and Arabs occupied parts of the island then for an extended period. By 670 they controlled the entire Middle East and began attacking even Constantinople itself. From this time they began conquering Northern Africa, and by 711 they are crossing into Spain. In 726 and again in 740 they captured Syracuse on Sicily, but never took the entire island until the 9th century. In 736 the Arabs took Georgia north of the Caucasus Mountains. In 751 they even defeated Chinese forces in a battle near the Talas River in modern-day Kyrgyzstan. By 762 Baghdad was created as the capital of the Abbasid caliphs, and Islamic conquests are virtually finished. Yet it is evident that the main period of Islamic conquest lasted about 5 prophetic months, or nearly 150 years. Until 1060 AD, when the Turks began to take Anatolia from the Byzantines, Arabs competed mostly among themselves, in lands they had already occupied to some extent, such as the taking of Crete and southern Italy – portions of which some Arabs had long occupied - in 820 and 827 AD. 7 And the likenesses of the locusts are like horses having been prepared for war, and upon their heads as crowns like gold, and their faces as faces of men, 8 and they had hair as hair of women, and their teeth were as of lions’, 9 and they had breastplates as breastplates of iron, and the sound of their wings as a sound of many chariot-teams of horses running into battle, 10 and they had tails and stingers like scorpions, and their power is in their tails to injure men for five months. 11 They have over them a king: the messenger of the bottomless pit, whose name in Hebrew is Abaddon but in Greek he has a name, Destroyer. 12 One woe has departed. Behold, there come yet two woes after these things! This is a poetic description of the Arab hordes. Apollyon is a Greek word which means destroyer. This is how we should view Mohammedism, even to this very day – as a destructive force to our Christian Civilization. 13 And the sixth messenger sounded the trumpet, and I heard one voice from the four horns of the golden altar before Yahweh, 14 saying to the sixth messenger, he having the trumpet: “Release the four messengers who are bound by the great river Euphrates!” 15 And the four messengers had been released, who had been prepared for that hour and day and month and year, that they should kill a third of the men. 16 And the number of the armies of the horsemen is two hundred million. I heard the number of them. 17 And thus I saw the horses in the vision, and those sitting upon them, having fiery-red and hyacinth and yellow breastplates, and the heads of the horses as heads of lions, and from their mouths came out fire and smoke and sulfur. 18 From these three plagues a third of the men had been killed, from the fire and from the smoke and from the sulfur coming out from their mouths. 19 For the power of the horses is in their mouths and in their tails, and their tails like serpents, having heads and with them they injure. Again, both Howard Rand and Bertrand Comparet correctly identified this second woe as a description of the Turkic invasions of Byzantine lands. This is the release of those bound by the Euphrates, which is metaphorical and not a literal reference, so that the Turkic hordes – already converted to Mohammedism by the Arabs in the 7th and 8th centuries - can begin to cross from the east. This process began in 1055 AD, when the Seljuk Turks captured Baghdad. Eventually they came to control nearly all of the formerly Arab lands, under the Ottoman Empire, but that is not our concern here. They began to move on Christian lands around 1064 AD when they began to clash with Byzantine troops in Asia Minor. In 1067 they attacked Caesarea and then Iconium in central Asia Minor. Although initially repulsed, within thirty years they controlled all of Anatolia. This ushered in the period of the Crusades, but wherever the European nations were able to recapture lands for Christendom, the results were only temporary. Furthermore, the Norman raids of the Balkans and southern Italy and their sacking of Constantinople in 1204 weakened efforts, rather than helping them. By the 14th century the Turks occupied the Balkans, and occupied or subjected many of the Black Sea nations. In 1453 Constantinople, surrounded by lands already fallen to the Turks, finally also fell to them. Looking at Byzantine resources in this period, compared to Turkic resources, it is amazing that the city held out as long as it did. Going back to the text of the passage being discussed here, verse 15 from the King James Version reads in part “for an hour and day and month and year”, rather than “that hour and day and month and year”. The Greek may read either way, yet the interpretation need not change. If we interpret this time period by the prophetic time scale of a year for a day, this would add up to around 391 years and 15 days. The Turkic conquests of Anatolia began around 1067 AD, and their conquest of the of Eastern Roman Empire ended with the taking of Constantinople in 1453 AD, a that is a total of 393 years, very close to the 391 years of this prophecy. The army of two hundred million men in verse 16 need only represent the number of invaders over this nearly 400-year period. This particular cannon is shaped just like a lion, including its limbs, and the mouth of the lion is the mouth – or muzzle - of the cannon, while its tail looks like a long serpent up its back, where the fuse was lit, just as John described. 20 And the rest of the men, those who had not been killed by these plagues, did not even repent from the works of their hands, that they do not worship demons and idols, things of gold and things of silver and things of copper and things of stone and things of wood, things which are able neither to see nor to hear nor to walk. 21 And they did not repent from their murders nor from their drugs nor from their fornication nor from thefts. When the Catholic religion – by which the true Christian religion is not meant - is compared to the ancient Greco-Roman pagansim, we see that there is not much difference. The Catholics paganized Christianity, by transferring the ancient pagan gods and goddesses into the false conception of “saints”, thereby actually worshipping demons, and by their idolatry in the making of statues representing these things. The anti-Christian practices of pharmakeia – the use of drugs, and fornication – which is race-mixing, were also prevalent in Byzantium and Rome. They still are today, and we who remain of our race will never understand these things until we study our bibles and understand our history.